Today with the advance of technology everybody use smartphones, Laptops and PC’s for their own work. In every field computers are used to increase efficiency and to save the time like in Banking sector, Stock Marketing, Corporate sector and in organization for data entry works. With the advancement of technology all of these sectors start using Computers for record maintenance instead of using hard copies. So to do data entry work on desktop we need to improve typing speed. Typing speed is skill which is depend on practice and way to type. More typing speed means more work and more money. Typing speed is necessary for Employees and Professional Coders as well as developers. If you are an Employee and have not good typing speed then don’t worry about this because in this article we explain about some online typing websites which are best to improve typing speed online. Learning typing online is good because you can learn easily without any need to install or download any typing software and you can learn typing online on any device having internet connectivity whenever you want to learn. Best Websites To Improve Typing Speed Online. 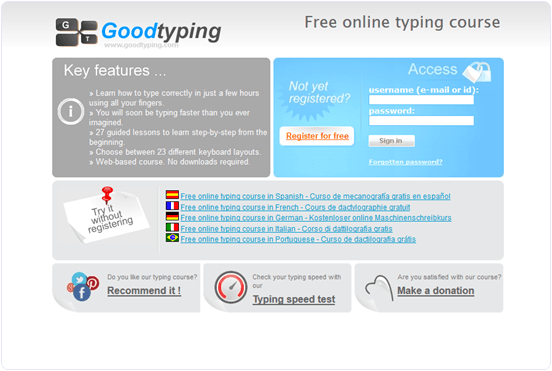 Goodtyping.com is the best website to learn and improve typing speed skills. After opening website we have to create an account to start the course. The account sign up is free. This website offer typing course in different languages like English, Spanish, French, German, Italian etc. It offer you the 27 different typing lesson start from beginning to end. It also offer you 23 different keyboard styles. After attending the course you will feel incredible change your typing skills. After learning typing on Goodtyping.com, you should try 10-Fast-Fingers.com for more fingers placement. It focus on finger placement rather than typing. This websites also offer you various typing games, typing competition and typing tests to improve typing speed with fun and practice combination. Unlike Goodtyping.com you do not need to create an account on this website. This site allow you to compete with your friends. Another best typing website is typing.com to learn online typing. 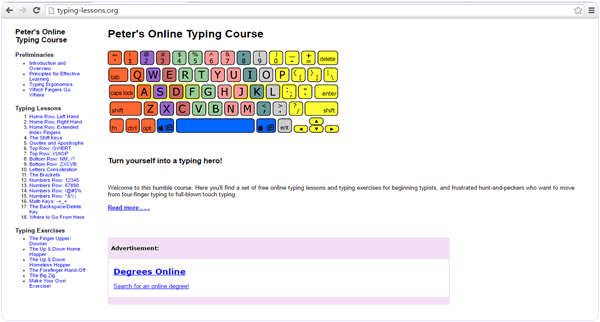 This website provide the user with typing tutorials, typing games and free official typing certificate. This website provides you with reviews in your problematic keys and also create graph of your performance. For certificate we have to apply for typing certification and this site provide you with beginners to high level courses. 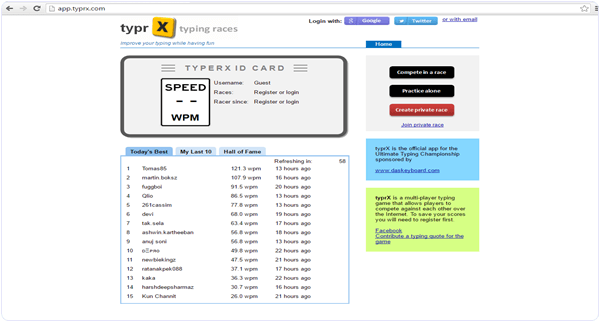 Typeracer.com is another popular online typing website which is specially for intermediate typing speed persons. You have to create an account before starting and then start learning. 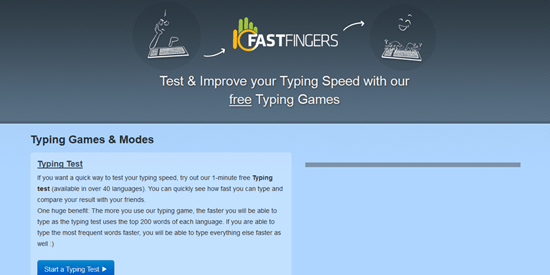 This websites compare your typing speed with others so you will compete your friends. It also provide the list of top person have fast typing speed. It provide option for practice and also for enter a race with your friends and with others. Typeonline.co.uk is another websites which improve your typing a lot. It offer you the numerical courses along with letters who need more numerical typing. Typeonline.co.uk. provide typing lessons from low level to high level. 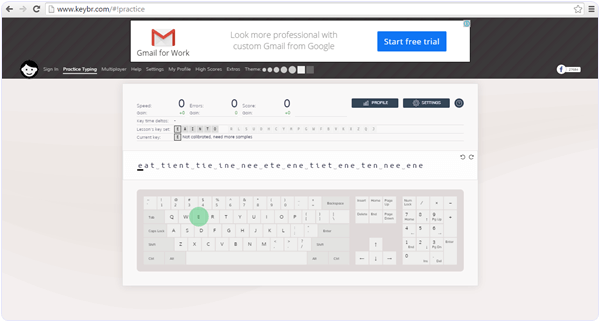 It also provide the typing test, practice option and notice your typing speed. It is one of the most popular website in the list of best typing website to provide us online typing training. We can easily sign up with Facebook and Google plus. Keybr provides step by step typing guide. It stores our performance in its online server where we can view our typing statics. Keybr provides our typing speed, accuracy and error count. It also provide multiplayer typing race game to compete with others. It is another best website in the list of best typing websites to increase our typing speed. It provide typing tutor in three different languages including English, Francis and Espnol. This website has attractive look and easy to use interface. We can easily sign up on this website using Google plus, yahoo manually by filling our details and start our course. We can also take speed test in this website. It also note our speed and accuracy during typing. 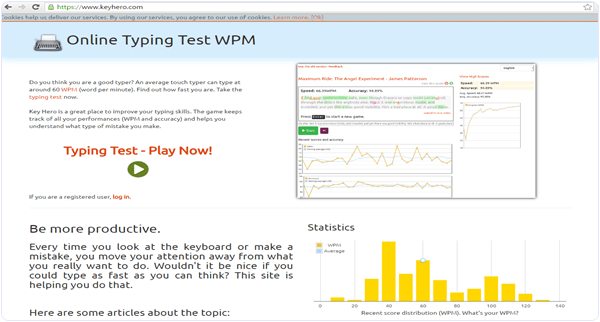 It is another best website to judge our typing speed and accuracy. After learning typing we want to compete with other people around the world to know our capability and our place in the world. This website provide a digital platform to compare our speed and compete with other. First we have to register on the website.After that we can take part in online racing. We can also practice alone. Rapidtyping is also a good website in the list of best websites to improve typing speed. It provide online typing speed test with other people around the word. It also note our speed and accuracy and give champion list based on the typing speed. 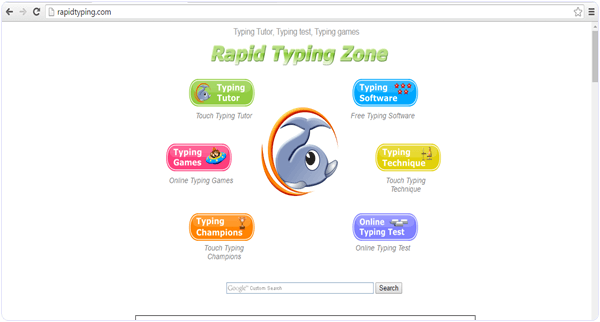 Rapidtyping also provide various typing games and training to play these games. It also provide its software for free of cost to learn typing easily offline. It is a best platform to compete with others. It is another good website that provide us an online typing course without any cost. It provide theoretical course with effective diagrams. This site also provide fingers position for each lesson and row. We can easily learn the various facts of fast typing through this websites. It provide simple interface and efficient enough to guide us about typing skills. 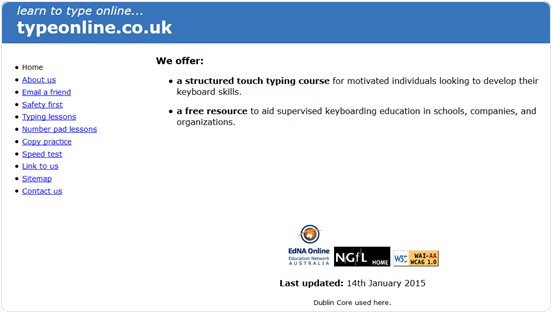 If somebody wants theoretical course about typing then this website is really for you. So these are best online websites to improve typing speed skills online. If you have any of the websites online for improving typing speed please share it with us.